What better way to celebrate Earth Day this week than to highlight eco-friendly adventures and unplugged escapes throughout Mother Nature’s playground, otherwise known as Colorado. Throughout Colorado, businesses have worked to develop programs that protect and nurture the environment, and help visitors do their part by immersing themselves in environmentally friendly accommodations, dining experiences and activities. 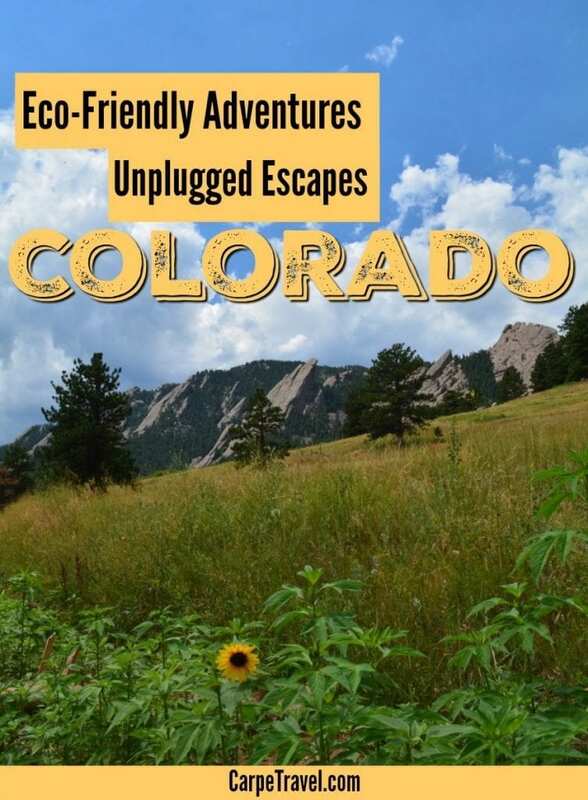 Along with a plethora of eco-offerings, many of Colorado’s getaways encourage visitors to disconnect and experience an unplugged vacation where guests can escape from buzzing cell phones, laptops and Wi-Fi passwords. Here are just a few Colorado destinations for an eco-friendly and unplugged getaway. Have you visited any of these spots? Have more eco-friendly adventures you’d like to share? Let us know in the comments. Estes Park Outfitters Lodge (Estes Park). Surrounded by national forest and Rocky Mountain National Park, Estes Park Outfitters Lodge is a secluded mountain retreat that is solar powered and receives its water from mountain springs at the headwaters of Fish Creek. In the winter months, guests can take advantage of several miles of groomed trails for cross country skiing/snowshoeing right outside their doorstep. During the summer, taking a hike means coming across mountain meadows, hidden ponds and incredible pinnacle views of Estes Park. Sylvan Dale Ranch (Loveland). Located near Loveland, Sylvan Dale Ranch is close to town, but a world away. With no televisions or telephones, the ranch encourages guests to leave technology behind to experience an authentic rural getaway. The ranch also strives to maintain the property as natural as possible with its very own herd of All Natural Grass Fed Beef and sustainable agriculture practices. Along with traditional ranch activities such as horseback riding and bass fishing adventures, visitors can learn how the ranch produces sustainable foods and manages the lands in a regenerative and ecological way. Monarch Mountain (Salida). Nestled into the Continental Divide, Monarch Mountain is one of just three ski mountains in the state that operates on 100 percent all-natural snow. The mountain receives more than 350 inches of snowfall a year and doesn’t require any water to manufacture the bountiful powder. Guests who are looking to “earn their turns” can try skinning and snowshoeing on the mountain by receiving no assistance from lifts. Uphill travel, winding alongside already established trails, is often thought as one of the best ways to unplug and get exercise outside during winter months. Tomichi Lodge (Whitepine). The Tomichi Lodge is a rustic, off-the-grid backcountry lodge perched at 10,300′ just west of the Continental Divide in the Gunnison National Forest. The lodge’s power supply stems from an on-site, hydro-electric system which harnesses the gravity-flow of mountain creek water and transforms the force into usable amperage/electricity that can be used at the lodge and/or stored for later use. The system is also backed up by a single solar panel. Guests can truly enjoy an unplugged stay as there is no internet or cell phone service at the lodge but an array of outdoor activities keep adventurers entertained all year long. Devil’s Thumb Ranch (Tabernash). Amidst 6,000 acres of frosted meadows and lush woodlands, Devil’s Thumb Ranch is an eco-luxe ranch resort and spa that is environmentally sensitive year-round and incorporates a geothermal radiant heating system and water sand filtration system. The Ranch House Restaurant sources its food from sustainable and locally farmed produce, fish, meat, and game (85% from Colorado sources), including its own Ranch raised pure bred Wagyu beef. Sun Water Spa (Manitou Springs). Visitors are invited to de-stress as they soak in the healing waters of the Manitou Springs mineral springs. The cedar wood tubs are filled with mineral water from the famous Seven Minute Spring; the same water which flows from the Manitou Karst aquifer. Using an array of solar panels, the water’s temperature is raised generally to between 100 to 104 degrees. Guided yoga class, open-air massage and other treatments are also offered at this solar-powered escape. Solar Roast Coffee (Pueblo). As the world’s only commercial solar-powered coffee roaster, Solar Roast Coffee is set in the perfect location with more than 300 days of sunshine gracing the Pueblo area. The solar panels on the roof provide solar energy to the operations and the grid. Using solar power allows the beans to roast with a gentle heat resulting in a lower temperature roast that produces incredibly rich and flavorful beans. Solar Roast Coffee is also Certified 100% USDA Organic, specializing in single origin coffee from all over the world. Guests who are curious about the process are welcome to stop in the shop for a cup of joe and solar explanation. Tennessee Pass Cookhouse (Leadville). Heated by wood stove and lit by candlelight the Tennessee Pass Cookhouse is an off-grid yurt that serves up gourmet dinners with local foods such as Colorado rack of lamb and grilled elk tenderloin. In the winter months, guests can make reservations to ski or snowshoe to the cookhouse. To complete an unplugged evening, the luxury yurts on property are a great way to disconnect and enjoy time spent with loved ones. Agape Farm & Retreat (Paonia). On the western slope of the Colorado Rockies, in the North Fork Valley, Agape Farm & Retreat is a vibrant bed and breakfast that combines everything one would expect from a farm stay with energy efficient practices thanks to solar hot water and R-29 insulation. The farm grows award-winning Pinot Gris grapes along with organic veggies and fruits that can be savored at breakfast every morning. Guests can choose to stay in one of the rooms in the home, or retreat further into the yurt on the property, all which boast a restful and meditative experience with beautiful views. The Broadmoor Fishing Camp (Colorado Springs). At the Broadmoor Fishing Camp, guests can get away at an old-time fishing lodge on 76 acres next to one of Colorado’s top-rated trout streams. Boasting more than five miles of private river frontage, the Tarryall River offers some of the best angling in Colorado. After a day of fishing for wild brown and brook trout, guests can relax in one of the camp’s rustic yet well-appointed guest cabins that are far from the reaches of cell phone reception. During the evenings, visitors gather in the Main Lodge for artfully prepared meals and relaxation. Waunita Hot Springs (Gunnison). Like numerous other hot springs in Colorado, the Ute and native tribes were some of the first to call Waunita Hot Springs home and to relish in their healing powers. Today, Waunita Hot Springs Ranch is a family-friendly destination where guests feel as if they’ve stepped back in time into a scene from “The Waltons.” This remote lodge provides an unplugged getaway for the whole family where guests can participate in horseback riding, fishing, swimming in the geothermal hot springs-fed pool and much more. Chautauqua Cottages (Boulder). Located at the bottom of Boulder’s famed Flatiron mountains, the cottages at Chautauqua are accented by hiking trails right outside guests’ front door. The cottages are without TV and offer very minimal Wi-Fi. Guests are entertained throughout the year by the various programs, lectures, concerts and films hosted in the Chautauqua Community House and Auditorium. Bear Grylls Survivor Academy (Granby). The Bear Grylls Survival Academy 24-hour Family Course in Colorado takes place at Snow Mountain Ranch, where the wild and rugged environment is ideal for Bear’s unique style of survival training where participants benefit from a wide range of learning opportunities. A team of highly trained experts facilitate learning, offer advice and guide participants through this grueling 24-hour course. Guests learn to forage, identify animal runs and lay traps, skin and gut using survival knife skills, navigate by day and by night, build emergency shelters, stalk, protect from attack, wilderness first aid and much more. Looking for more ideas for things to do in Colorado or Colorado’s wine regions? 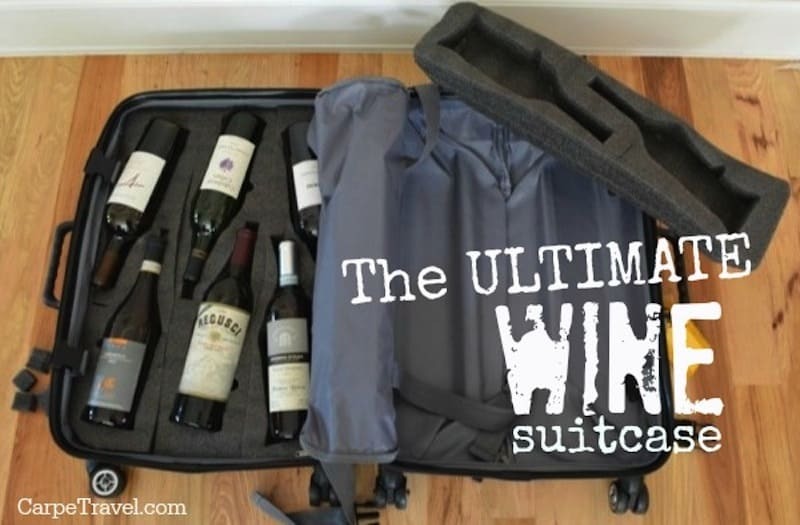 Click on over to Carpe Travel’s Colorado Wine Travel Guide. I have traveled to Colorado a few times now, and every time it seems to get more and more beautiful. If iI could move here eventually, I wouldn’t complain. Thank you for all of the info. Definitely a one-of-a-kind eco-friendly place! What a great place to bring my solar powered gadgets and just hike with the family. Thanks for sharing this! Good to know, I’ll have to check it out. Thanks! I couldn’t agree more to what you said in this article. I think Colorodo is a great hotspot for destination and that I would love to try everything you mentioned in this article. I love this post keep this up! Thanks! Colorado has SOOOO much to offer. Seriously love New Belgium Brewery…just wish that they had more sour beers. It won’t stop me from going back, again, and again, and again though! Great list. was in estes park years ago, hope to go back. Heard a lot about Paonia, hope to get there soon.